Get affordable new flooring from a team of professionals without sacrificing style or appearance by choosing luxury vinyl tile. The flooring specialists in our showroom are knowledgeable about all of the styles of resilient flooring we carry and install for our clients. This type of flooring comes highly-recommended for both residential and commercial customers. 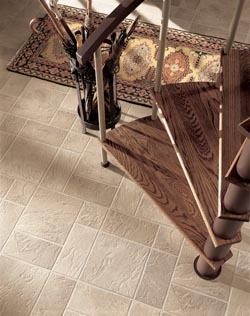 Choose our store for the best prices and widest selections when you purchase your luxury vinyl tile in Bedford, NH. Resilient Vinyl Tile: This style mimics the appearance of tile of all types and sizes. Clients choose the look of tile in patterns, mosaic styles, and more. This material is printed to mimic natural stone and ceramic in a variety of colors. Resilient Plank Flooring: This style resembles the appearance of hardwood flooring, with its grains and matching species. These planks are available in all widths, lengths, and sizes and made to look like the most popular hardwoods. Once you have invested in your new flooring, protect your purchase with the installation of vinyl plank flooring from our professionals. When you make a purchase and schedule an installation with our team, the Ultimate Confidence Guarantee covers your flooring. For the lifetime of the flooring, we will correct any installation-related problems. In addition, you may qualify for a refund if you find the same style elsewhere at a lower price. Contact us today to learn more about the available types of luxury vinyl tile in our flooring store. We are located in Bedford, NH, and serve the surrounding communities including Manchester, Hooksett, Concord, Hollis, and Merrimack.